← ONE FAMILY TAKES MY BOOK SKELETONS IN THE SWIMMIN’ HOLE TO WALT DISNEY WORLD! 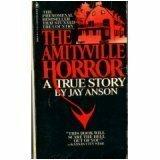 I read this book when it first came out back in the 1970s — I lifted it from my Dad’s den, which was crammed with all sorts of 1960s-1970s bestsellers like Ghost Boat, The Anthrax Mutation, and Jaws — and I was definitely way too young to be reading it, because it scared the hell out of me. At the time, though, it was sold as “a true story” — there’s much controversy now about whether it was or not, so that took a lot of the scare out of it. I will say that this book is not at all well-written (it’s awful, in fact, there are exclamation points in the narrative at least once on every page), but that’s not why anyone should read it. Read it because it’s a good old trip down 1970s lane in which people still have land-line phones, station wagons–and we were all a lot more gullible. This was a guilty pleasure. Posted on January 12, 2011, in Deep Thoughts & Fun Stuff. Bookmark the permalink. Leave a comment.